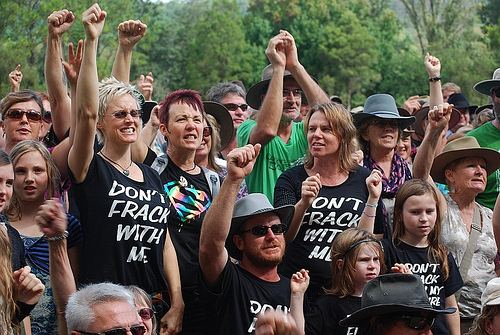 When community opposition becomes a ‘perfect storm’ for resource investors. The recent suspension of the exploration license of the speculative gas company Metgasco in the face of massive community opposition to its Bentley operation in the Northern Rivers should serve as a serious warning to investors in the coal and gas industry across Australia. The idea of the need for social license for extractive industries is not new, but it seems companies and investors are not looking beyond the formalities of community consultation to assess the real risks that community conflicts pose to their investments. A recently released research report makes exactly this point observing that “most extractive companies do not currently identify, understand and aggregate the full range of costs of conflict with local communities.”1 (p8) . What is often also not properly understood is the increasing sophistication of social movements when it comes to the issue of investment risk and social mobilisation. Non-linear change strategies are being employed by social movements that focus upon innovative methods of community networking as well as powerful new approaches to understanding the ‘system effects’ that can be harnessed to bring pressure upon corporate targets. In the case of Metgasco, it cannot seriously be argued that the risk of social conflict could have come as a surprise to a diligent company manager, and if it was a surprise for investors then there appears to have been a major disclosure problem taking place over the past several years. In May 2012, 7000 people marched through the streets of Lismore to oppose invasive gasfields, on a per capita basis if repeated in Sydney this would equate to about 640 000 people. In September 2012 a shire wide poll was conducted by the Australian Electoral Commission in Lismore and recorded a staggering 87% vote against the establishment of a gas industry in the region.2 University research in the Richmond Valley in 2013, where Metgasco continually claimed to have community support revealed 65% of respondents against the industry and only 16% in favour.3 Despite these hard sources of data Metgasco continued to insist in its communications to investors from 2012- 2014 that it had community support. Similarly there was an astounding lack of disclosure to the market about the impact of protests and blockades. To the extent that this denial also reflected an attitude in Metgasco’s management that community opposition was manageable, the roots of the company’s current dilemna become obvious. This week the state government suspended Metgascos exploration license as an historic confrontation brewed between 7000 mainstream residents of the region and more than 700 police. To say that Metgasco had failed in its community consultation obligations was nothing short of an understatement. The issue of industrial gasfield expansion has ignited a burgeoning and intelligent social movement across rural Australia in the form of the Lock The Gate movement, and the Gasfield Free Northern Rivers alliance has been a particularly powerful and innovative aspect of that national alliance. The meeting of farmers and environmentalists has gone well beyond being a novelty, it’s is now an established cultural force to be reckoned with. In the northern rivers, the movement has pioneered a number of social movement mobilisation and consensus building processes that have increasingly been taken up as far as way as Victoria, South Australia and the United Kingdom, as activists worldwide watch this space and learn. The ‘gasfield free community strategy’ is a powerful community consensus building process that is based on eyeball to eyeball communication across entire communities and the establishment of a civil defence pattern resembling the volunteer fire brigades so familiar to rural Australians. For Metgasco that has no other significant gas acreage outside of the Northern Rivers, how could the growing mobilisation of the region from 2012 onwards have been anything other than a material Investment risk? The gasfield free movement itself has been overt about the investment risk issue, waging an intelligent risk communication strategy in which it proactively targeted investors and shareholders with information about the scale of social movement opposition and articulated it as a serious risk. This campaign has included a raft of formal complaints to the ASX and ASIC about Metgascos failures to disclose the scale of community opposition, as well campaigns in public media. Modern social movements are intelligent and well aware of the power they have to generate external risk for companies that become their targets. Right now Whitehaven Coal at Maules Creek and Santos in the Pilliga are the focus of very similar dynamics as Metgasco. Added to this picture is a widespread perception of a failure of democracy in Australia where rural communities see the mining industry as having co-opted both major political parties and compromised our parliamentary system, and a global campaign of fossil fuel divestment, and an intelligent social movement across Australia and you have the ingredients of perfect storm for the resource sector. 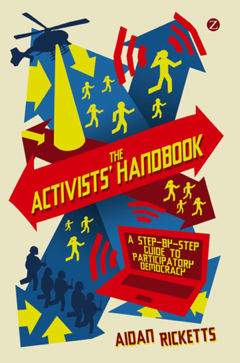 Aidan Ricketts is a law lecturer at Southern Cross University, and author of The Activists’ Handbook: a step by step guide to participatory democracy. 1 Davis, Rachael and Daniel M Franks. 2014. “Costs of Company-Community Conflict in the Extractive Sector” Corporate Social responsibility initiative Report no 66. Cambridge, MA: Harvard Kennedy School. 4 Ricketts, A 2013, ‘Investment risk: an amplification tool for social movement campaigns globally and locally’, Journal of Economic and Social Policy, vol. 15, no. 3. Failing in community consultation, is the government’s get out of jail free card. They are cutting their losses, and plugging the leak of the sinking CSG ship. Had Bentley gone ahead, the increased regional outrage & resistance, and the concomitant rising policing costs & national outrage, put all CSG licenses and the income they provide to the government (and politicians too it seems) at risk. Of course these risks are still present, but the government has deflected attention from Bentley, and avoided what almost certainly would have been a PR disaster, a financial black hole, and quite probably an eventual loss regardless. Blaming Metgasco for lack of community consultation — despite possibly being true — is equally applicable to dozens of operations, and is utterly irrelevant: what’s the benefit of consulting a community that is well-informed and starkly opposed, especially when there is no mechanism for honouring their opinions? What the government is really saying is: there’s nothing wrong with CSG mining, there’s nothing wrong with CSG regulations, and there’s nothing wrong with continuing business as usual for the rest of Australia. Both political parties as well corporate bodies share one common flaw that is a product of contemporary western society. This flaw is that, while our political and corporate systems may have originally developed to SERVE the people, today they are largely treated as systems designed to MANIPULATE the people into doing the bidding of corporate bodies and political parties alike. To this end, they have become very adept at utilising the media and marketing agencies as tools to aid that process. However, in recent times, ‘the people’ are becoming increasingly more informed (largely through new communication avenues such as social media) and ‘savvy’ to this form of manipulation and, in addition, are becoming increasingly frustrated by the constant lies, corruption and greed associated with both the political and corporate sectors. Right now, I feel that we are just beginning to see a ‘rebirth’ of the idea that the democratic political system is all about serving the people, and that politicians are actually employed by the people to do that job. They are, in effect, our SERVANTS, NOT our MASTERS! As such, the people are now beginning to demand a social license and a degree of social justice where actions that may affect their livelihood and general well-being are concerned. Bentley was indeed a ‘Eureka Stockade’ moment and both politicians and the corporate sector need to be very aware of that. Indeed, had Metgascos license not been suspended in such a timely manner, and the police had moved to remove the protestors as planned, it may well have resulted in the most significant catalyst for change in Australia since the 1960’s. A catalyst that would undoubtedly seen major protest actions throughout Australia. Obviously, the government was sensible enough to withdraw at the 11th hour having been made aware of the degree of community sentiment on this issue. But it is not over … on the contrary, this may well just be the very beginning of the global peoples rEvolution that has long been anticipated by many. People in general are sick of being ‘taken for a ride’ and demanding a whole new paragigm shift in thinking and attitudes.